A significant limitation of current sensor fusion techniques (both in MSE-API and other systems) is that spatial attributes are provided by one sensor only and are based on its inherent precision. In MSE-API for example, only the Kinect sensor provides location and only device-embedded sensors provide orientation. Integrating sensors with different capabilities and precisions is not supported by current approaches and deployments cannot mix high-precision, high-cost sensors with low-fidelity, low cost sensors. The goal of this project is to develop a spatial probability model that allows incorporating a wide range of sensor technologies to be used concurrently. By mathematically modeling the different capabilities of the different sensor technologies, a certain precision probability can be assigned to the tracked spatial attributes. This, in return, leads to each spatial attribute possibly having numerous degrees of precision, and allows deployments to easily combine and use the sensor information from various sources. In addition, by utilizing technologies such as iBeacon1 and Near Field Communication (NFC)2, devices can determine the proximity of neighboring devices in the environment, and thus providing approximate spatial information (see Figure 1). As a result, deployments can cost effectively instrument spaces based on application needs while providing a graceful degradation of spatial awareness. The complexity of the technology will be hidden behind an easy-to-use reusable API, an extension of the current MSE-API, which will allow application developers to build multi-surface environments effectively. Providing this model directly contributes to the “Building Infrastructure for Digital Surfaces” theme, as it improves the tracking infrastructure of multi-surface environment, and can be easily incorporated into existing multi-surface systems. We are currently using MSE-API with three industrial partners, C4i Consultants Inc, Byye Labs and Brigade Creative Corp. All partners are interested in a probabilistic version of the approach to reduce deployment costs in different environments and enhancing graceful degradation when location information becomes imprecise. 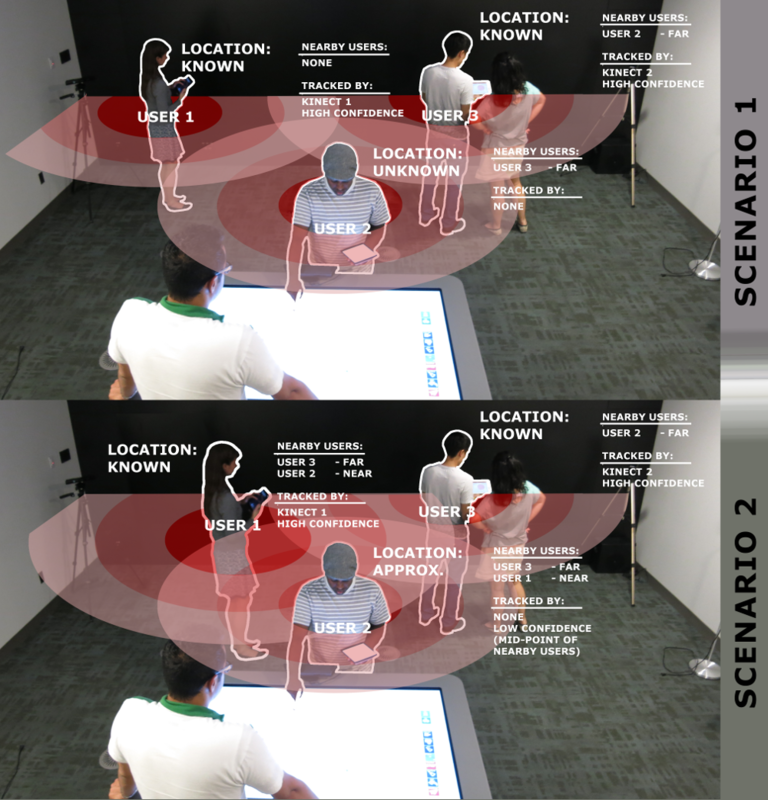 This project will result in a spatial probability model to provide improved spatial awareness in multi-surface environments. The corresponding implementation will be released as an open-source project and will be used in application projects with our industry partners. We will target high-profile engineering and HCI conferences (UIST, CHI, ITS or similar) to present our results.